On Thursday, for the first time, astronomers and scientists are detailing their findings about the moons in the US journal Science. Pan, Daphnis, Atlas, Pandora and Epimetheus each measure between eight and 116km in diameter. They are either round, shaped like flying saucers or resemble potatoes. They are wedged in the gaps separating the planet's rings. Cassini spent 13 years near Saturn. In its final year of operation, it inserted itself between the rings, sending data back to Earth until it went dark on September 13, 2017, 20 years after its launch. Some 4 000 scientific articles have been published about Cassini's findings, and the well of knowledge is nowhere near dry. "I want to work for at least another decade on this stuff," Bonnie Buratti, a planetary astronomer at the US space agency's Jet Propulsion Laboratory in California, told AFP. 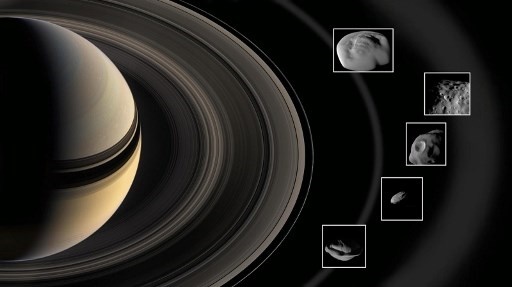 The data captured by Cassini's instruments are still being assessed. The study published on Thursday is only one preview of the discoveries yet to come. But the study reinforces the dominant theory that Saturn's rings and moons stem from the same celestial body, which shattered as a result of some kind of collision. "The largest fragments became the core of these ring moons," explained Buratti, a 33-year veteran of NASA. "And what happened was the moons continued to accumulate particles from the rings – this is what we saw close up, the accumulation of the ring material onto the moon." This would explain the gaps left behind the moons. More than three dozen co-authors from the US, Britain Germany and Italy worked on the study published on Thursday – a rather remarkable collaboration, according to Buratti. "It's all in flux, science driven by disagreements," she said. The question gnawing at astronomers is to figure out how old the rings are. A study published in January, based on Cassini data, concluded that they were relatively young – somewhere between 100 million and one billion years old. But other models and methods suggest a different answer. "Science is never cut and dried – you never have your final answer," Buratti said.